Last month, I had a Facebook Live Session with Stanley where I had shared two REITs that I had invested lately. 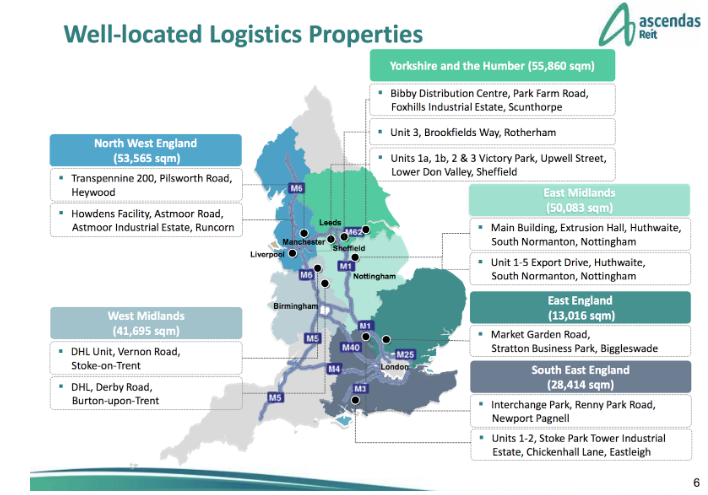 One of the REITs is Frasers Logistics & Industrial Trust (FLT). In the midst of the session, there was a question asked by a listener to compare FLT with Ascendas Real Estate Investment Trust. 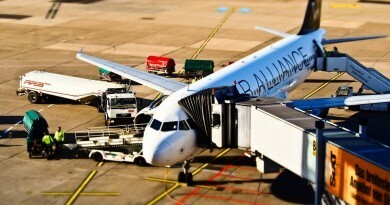 To be honest, I find both REITs have their investment merits and my decision to go with FLT is more of a ‘preference’. I still keep Ascendas REIT in my watch list, waiting for a good time to acquire some myself – if the price is good. Today, Ascendas REIT is trading at S$ 2.56 an unit, closer to its 1-Year Low of S$ 2.48 on 11 October 2018. 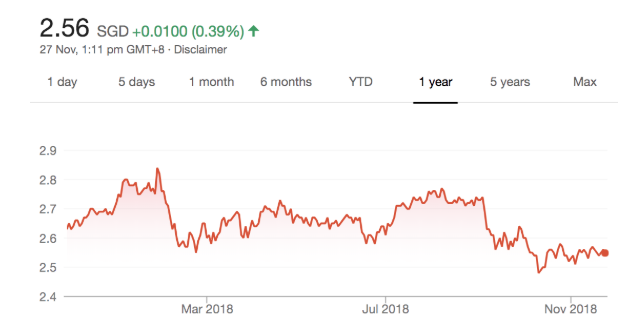 So, is this a good time to invest in Ascendas REIT? Let us find out, shall we? 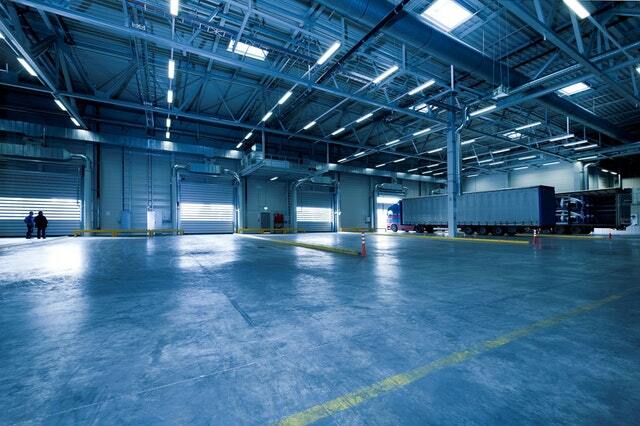 Ascendas REIT has been aggressive in expanding its property portfolio over the last 10 years. 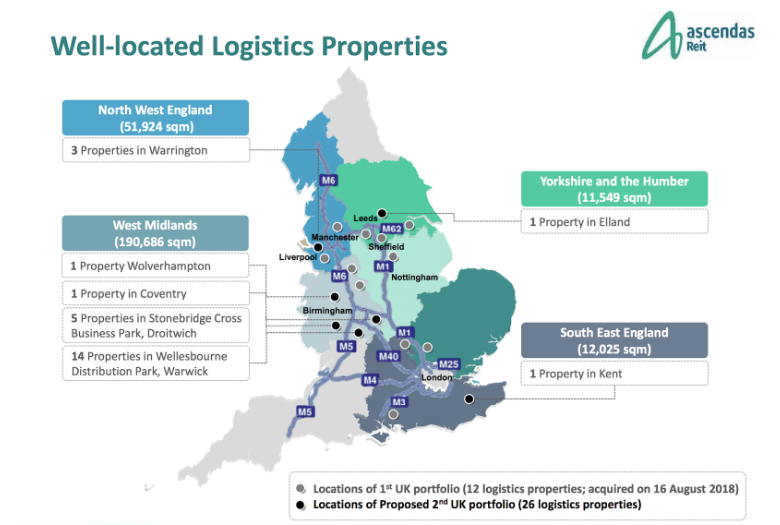 This includes its significant move to invest in Australia in financial year (FY) 2016 and in the United Kingdom in FY 2019. Overall, its portfolio grew from 89 properties with total assets of S$ 4.5 billion in 2009 to the present size of 145 properties with total assets of S$ 10.8 billion in Q2 2019. Ascendas REIT has achieved growth in gross revenue, distributable income, and distribution per unit (DPU). 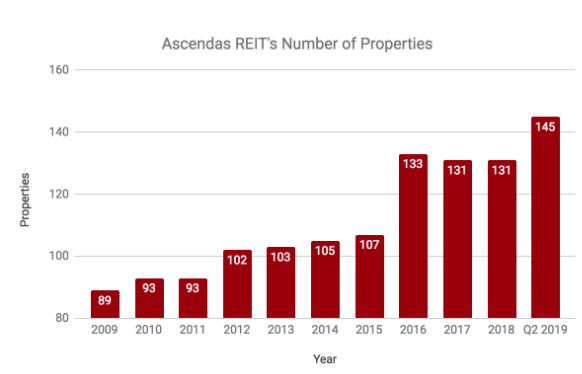 For the past 12 months, Ascendas REIT had brought in S$ 867.7 million in revenue and S$ 633.6 million in distributable income. The REIT has paid out 15.769 cents in DPU during the 12-month period. As at 30 September 2018, Ascendas REIT has reported total debt amounting to S$ 3.59 billion, thus, having a gearing ratio of 33.2%. Its weighted average all-in debt cost is 3.0% per annum. Starting in 2019, Ascendas REIT has been given an upgrade in its credit rating from Moody’s from A3 Stable to A3 Positive. Total Singapore Portfolio – 3.034 million sq. 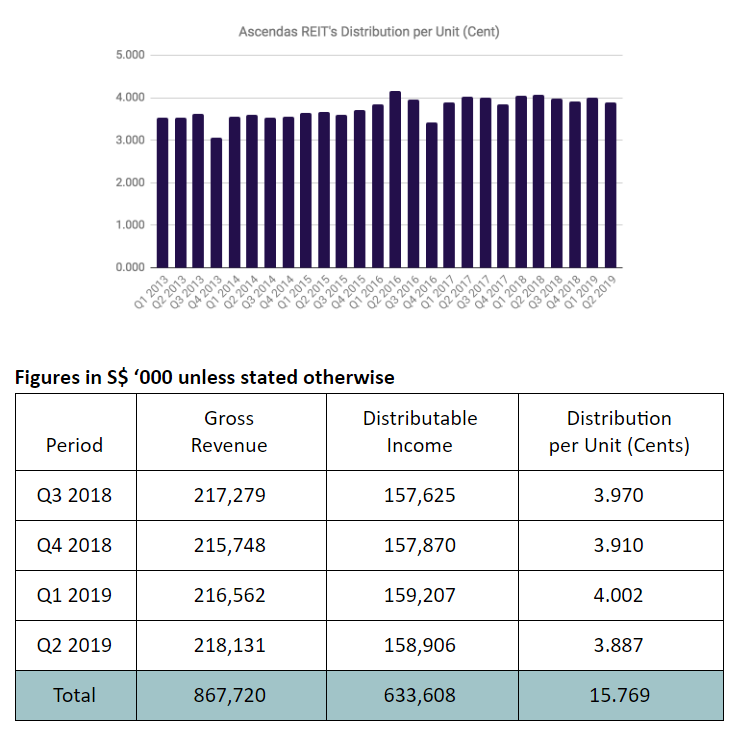 m.
For Q2 2019, Ascendas REIT’s Singapore Portfolio has recorded a slight drop in occupancy rate to 87.1%, from 88.1% in Q1 2019 and 90.1% in Q4 2018. This is due to non-renewal of rents at two logistics properties namely, 9 Changi South Street 3 and 40 Penjuru Lane. 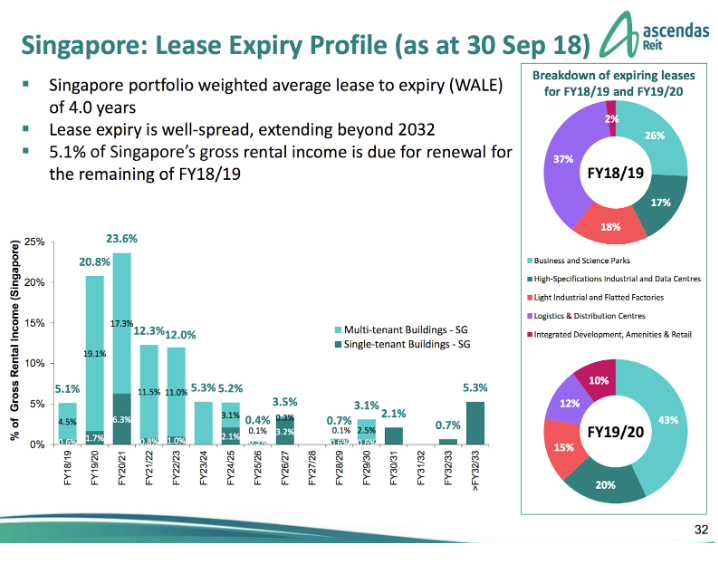 For Q2 2019, its Singapore Portfolio has weighted average lease expiry (WALE) of 4.0 years where 50.5% of its leases would expire starting in FY 2022 and FYs beyond. Total Singapore Portfolio – 0.796 million sq. 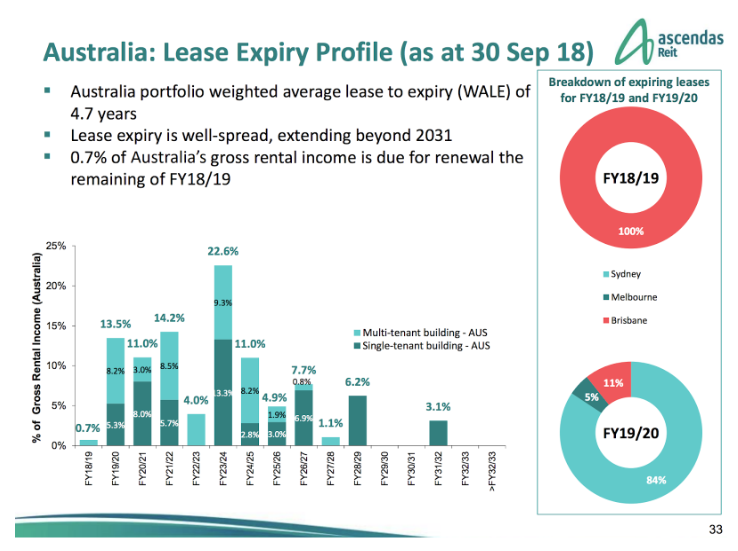 m.
Overall, its Australia Portfolio has achieved high occupancy rate of 98.5% and it has weighted average lease expiry (WALE) of 4.7 years with 74.8% of leases will expire starting in in FY 2022 and FYs beyond. Total Singapore Portfolio – 0.243 million sq. 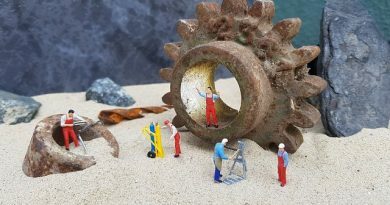 m.
The above acquisition was completed on 16 August 2018. The above acquisition was completed on 4 October 2018. As the acquisition of these 26 properties are completed after Q2 2019, as I write, Ascendas REIT has expanded its portfolio from 145 properties to 171 properties. As I write, Ascendas REIT is trading at S$ 2.56 an unit. Thus, its gross dividend yield is 6.16% based on its latest DPU of 15.769 cents in the last 12 months, close to its 5-Year Gross Dividend Yield Average of 6.14%. 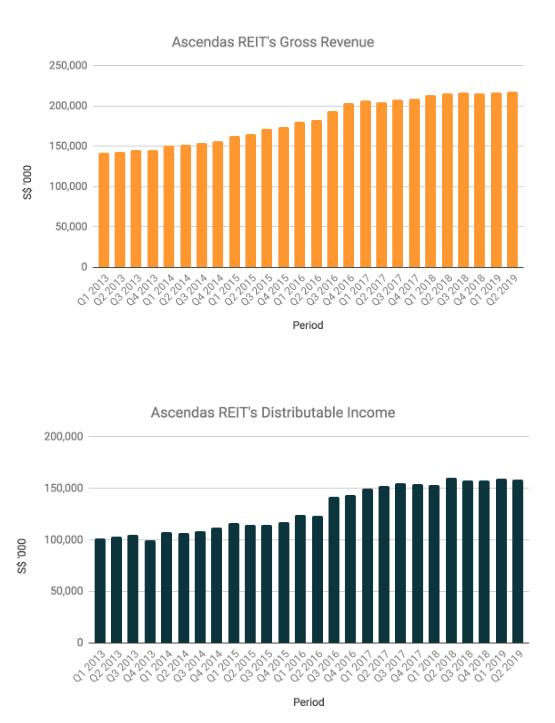 In Q2 2019, Ascendas REIT has reported net asset value of S$ 2.06 per unit. So, its current P/B Ratio is 1.24, close to its 5-Year P/B Ratio Highest of 1.25. So, should I invest in Ascendas REIT? 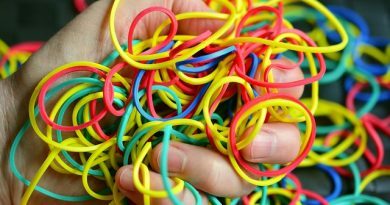 Here, I would list down a handful of questions as a guide before you make any decision on Ascendas REIT? Is having a Gross Dividend Yield of 6.16% per annum attractive to you? Would you buy more units of Ascendas REIT if it drops in prices? Ascendas REIT’s Singapore Portfolio has a drop in occupancy rates over the last 2 quarters. Is this considered a risk to you and one that you are willing to bear if you invest in Ascendas REIT? Ascendas REIT is expanding into Australia and the United Kingdom. Are you in favour of this move? What are your thoughts on both markets in the future?